St Patrick's Well is located near Clonmel a short distance south of the main Clonmel, Cahir road. It is an old religious site situated in a sheltered glen where a large volume of spring water continuously wells up from underground. The church was built in the seventeenth century, but there are traces of an even older building. Inside the walls is the tomb of Nicholas White of Clonmel who died in 1622. 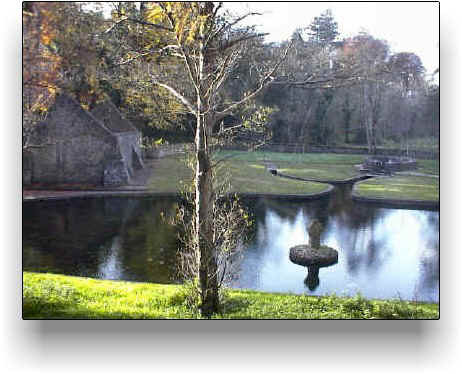 At the centre of the small lake is a weathered Celtic Cross which dates from early Christian times in Ireland. To enter the site visitors must descend a long flight of stone steps, so it is unsuitable for wheelchair users. St. Patrick's Well is in the same area as Marlfield Lake, so you might like to visit both on the same day. Distance from The Apple Farm, 7km.